Penzance in a Peterson Deluxe System 9s, vulcanite p-lip fitted stem (9mm). Meer with Big N Burley. Now smoking year 2014 St. James Flake in a 1980 medium bend black sandblasted silver band Peterson Donegal 805 Bulldog and a black vulcanite saddle p-lip stem. Ice tea and bergs is my drink. SG Celtic Talisman in the Muhsin volcano. 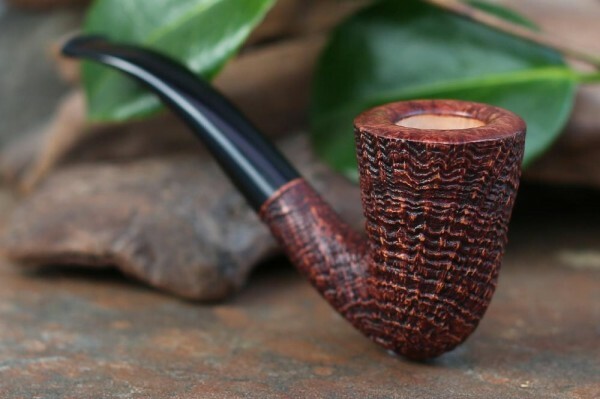 G Flake in a rusticated Eltang Sailor. Esoterica Margate in a Radice Clear F, handmade (9mm). Watch City Simply Red in a Straumbach cultured meer - hex panel w bent brindle stem. Baja Blast freeze is my beverage. Now smoking Sutliff Prince Albert Match in an old grain relief, partly smooth full bend "V" shape bowl Preben Holm Ben Wade Prominence freehand with the letter A and the numeral 2 in circles with a black vulcanite stem and ferrule in the military mount style. Ice water and bergs is my evening drink. Almost half way through this bowl of Watch City Simply Red in a 1980s White Pipe straight, smooth octagonal paneled billiard meerschaum with an acrylic yellow cream colored saddle stem. Just finished smoking Lane Burley and Black in a 2003 medium bent Ural meer with a lined and etched egg shaped bowl with a brown pearl acrylic saddle stem. Relaxing after a wonderful chicken parmesan and mashed potatoes dinner with a slice of banana pudding cake, and a couple scoops of vanilla bean ice cream for dessert. I'm half way through this bowl of year 2005 Tavern Tobacco Laurel Flake in a slight bend 1968 group 4S Dunhill Shell 475 cherrywood with a black vulcanite tapered stem. Watching the Mets-Braves game, and will listen to the rest when I go to work. War Horse Plug in a Gigi pot. Acadian Perique in a Savinelli 606KS. Now smoking D&R Raccoon’s Delight in a smooth 1976 Canadian GBD Seventy Six 256 with a black vulcanite saddle stem. 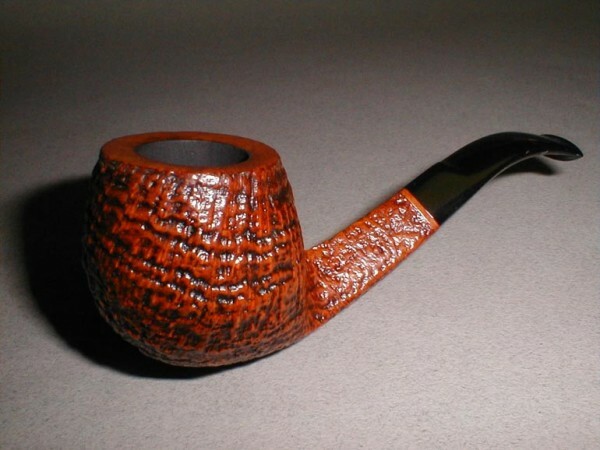 GL Pease Fillmore in a Stanwell Lovat. Delicious. Molto Dolce with Carter Hall 50/50 in a Savinelli Churchwarden. GH&Co Scotch Mixture in a Savinelli 111KS. Half & Half in an Upshall 5 P.
Samuel Gawith Golden Glow in a MM Country Gentleman. I have a lot of nice pipes but more often then not reach for a cob. A couple minutes away from smoking D&R A.B. Rimboche in a 1938 straight black grain relief Dunhill OX Shell bulldog with a silver band repair and a black vulcanite saddle stem. Working and listening to the MLB talk on the XM. 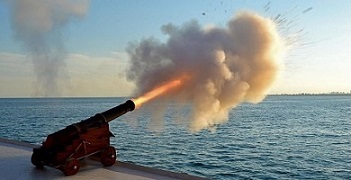 C&D Revelation In a Standard B42. PS Luxury Navy Flake in a Dr. Thomas Special with a dark rum and cranberry juice. PS LTF in the Hilson Cowbell. Enjoyed a tasty navel orange and am now smoking year 1999 Edgeworth Ready Rubbed in a 2015 Basil Meadows black sandblasted billiard with an aluminum band and a pearl red acrylic tapered stem. Taking a short work break to rest the ol' back. French Caporal Export (brown pouch) in a Peterson Tankard. Listing this a few minutes early as I go back to work: Smoker’s Pride Mellow Taste in a 1980s straight smooth Big Ben pot with a nickel band and a black vulcanite saddle stem. Probably my last smoke of the day, which is Wilke Lord Nelson in a light brown 1979 rusticated medium bend Italian Sir Jeffrey Dublin sitter with a flared top and yellow stem. Going to watch a little innocuous TV while I smoke. Mac Baren Club Blend in a figural meer by Medet, with coffee and the morning paper. John Patton’s Crossroads in a sandblasted Brebbia squashed tomato with a tortoise shell acrylic stem. 2012 Fribourg & Treyer Cut Virginia Plug in a Michael Butera Apple. Bayou Morning in a GBD smooth billiard. Spilman Mixture in a straight billiard Meerschaum etched in a wine grape theme; this one's for fish'n'banjo with prayerful wishes after a series of falls. Starting off my smoking day with year 2014 Edward G. Robinson's Pipe Blend in a 2014 Basil Meadows smooth slight bend squashed tomato with an aluminum band and a black pearl acrylic stem. Simply Orange is my drink. Relaxing after a tasty chicken cheese broccoli lunch, and am now smoking year 2005 Tavern Tobacco Laurel Flake in a slight bend 1968 group 4S Dunhill Shell 475 cherrywood with a black vulcanite tapered stem. A bottle of Sierra Mist is my drink. Watching The Irish in Us starring Cagney and O'Brien. MM Mark Twain with Big N Burley. Mac Baren HH Acadian Perique in a figural meer by Medet, with coffee. 2011 Dunhill Deluxe Navy Rolls in a Larrysson Dubin. GH Ennerdale Flake in the Cobiquari. Dunbar in a Sav. With a mega mug of instant coffee. GL Pease Embarcadero in a Charatan Canaries Dublin. Enjoying some GH Rum Flake out on the screened in deck in a recently purchased Briar Works prince. Coffee on the side with Charlie Parker “The Legendary Dial Masters” playing on the Bluetooth speaker. Hope everyone is enjoying what is left of the weekend. Just finished smoking Seattle Pipe Club Columbia River in a medium bend egg 2017 Royal Meerschaum Dragon meer with a black and cream swirl amber colored acrylic tapered stem. A short nap delayed that, poor li'l me! Now smoking year 2014 St. James Flake in a 1980 medium bend black sandblasted silver band Peterson Donegal 805 Bulldog and a black vulcanite saddle p-lip stem. Ice water and bergs is my evening drink. C&D Billy Budd Blonde in a figural meer by Medet, with coffee.